She’s not the stereotypical little old lady of yesteryear. Your grandma has style, personality and pizzazz. She brightens your day but can also provide the shade. 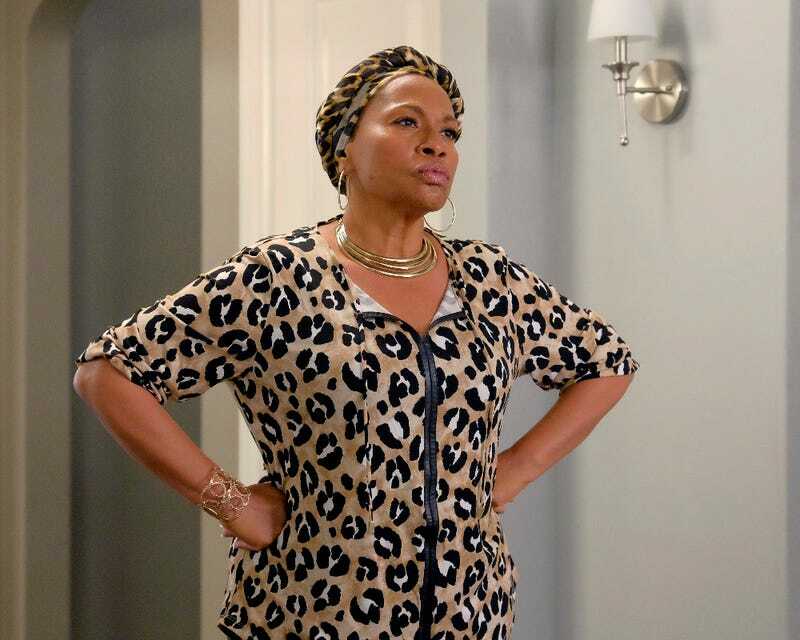 That sounds a lot like Ruby Johnson of Black-ish, played by the legendary Jenifer Lewis. What type of gift would this modern woman appreciate? We’ve got you covered. If your grandmother cries out to black Jesus on a regular basis and carries around her own leather-bound copy of “the good book” like Ruby Johnson, she might appreciate an audio version of the Scriptures. Available for download ($68) or on CD ($99), The Bible Experience features Angela Bassett, Loretta Devine, Common, T.D. Jakes, Bumper Robinson, Meagan Good, Jasmine Guy, Idris Elba, Samuel L. Jackson, LL Cool J, Tia and Tamera Mowry, Yolanda Adams and more of your favorite celebs reading the Scriptures. Bible thumping aside, Grandma takes a liberty or two here or there and isn’t averse to a hard drink every now and again. Make sure her spirits are lifted wherever she goes with this Personalized Petite Bling Flask from Things Remembered ($30, online only). There’s less whining when there’s more wine. Like Ruby, your grandma isn’t exactly a fan of her daughter-in-law’s cooking. So let Nana strut her stuff and teach the younger ladies (and fellas) how to burn with this Occasion 18-Piece Cookware Set from T-Fal, available at Macy’s ($129.99). She can show ’em better than she can tell ’em. If your grandma is like Ruby, she might sometimes focus on your faults instead of all your great qualities, but remind her why she loves you so much with this Grandma Wood Malden Picture Frame, available at Hallmark ($15.95). Fill it with that image of you and her that is guaranteed to make her glow with pride. She’s the one who told you, “If you don’t have anything nice to say, don’t say anything at all,” but sometimes Nana forgets. So nudge her in the right direction with this Fearless Faith Journal from black-owned Olivia Sophia Stationery & Gifts ($14.99) that will allow her to vent and share her unsolicited, strong opinions without offending anyone. Ruby Johnson likes to wear her hair natural, but some days she chooses to wrap it up. Colorful scarves can add some pop to her wardrobe while solving the problem of a bad hair day; and a headband like Nicole Ari Parker’s GymWrap ($19.95) can help maintain a style while minimizing sweat resulting from energetic, heated conversations (or hot flashes).